Certified Organic Integrated Low Carbon Farm providing pasture-fed Lamb as cuts, half or whole lamb. Integrated with-on farm Gluten free olive orchard and production of certified table Olives and olive products. Certification means excellent levels of humane animal and wildlife care is guaranteed and much more. Grown in Wymah, NSW. We have many varieties of olives, oils and tapenades (olive pastes) used for dressings, mixing in with salads, on biscuits, on platters and of course eating straight from the jar! We have delicious cuts of lamb and are happy to fulfill your order be it small or large! Our Mediterranean-like climate had allowed us to grow the most flavoursome organic olives and golden coloured organic olive oils. 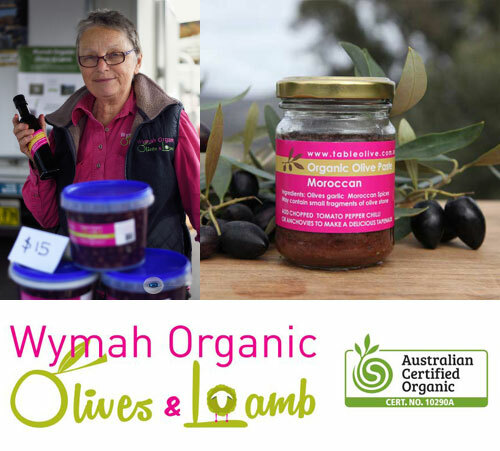 The lovely Wymah Valley grows lush pastures enabling us to produce sweet tasting, organic free-range lamb. We believe that soil is the most important factor when growing good olives and producing great lamb. We look after our soils, land, trees, animals and water sources with the upmost respect and care. We do not use pesticides or herbicides and are GM free. The farm is full of local wildlife and we have set aside 22% of the farm for regeneration. We choose to grow olives not only because they suit our climate but also to bring the goodness and health benefits of olives to more people. Olives are rich in antioxidants and the oil can help to lower cholesterol.